We’d love your help. Let us know what’s wrong with this preview of Cat's Paw by Mollie Hunt. To ask other readers questions about Cat's Paw, please sign up. 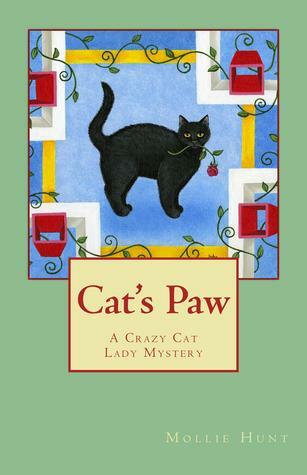 Cat's Paw by Mollie Hunt is the third book in the Crazy Cat Lady series. All Lynley Cannon wants is a vacation with her friend Simon at the Cloverleaf Animal Sanctuary. Her peaceful retreat is interrupted when a guest is murdered, and everyone seems to think she's the killer. A second murder proves her innocent, but sends her running back to Portland. Murder follows her home as dreams haunt her with what happened as she tries to get back to her life. When Simon shows up, convinced she's being st Cat's Paw by Mollie Hunt is the third book in the Crazy Cat Lady series. All Lynley Cannon wants is a vacation with her friend Simon at the Cloverleaf Animal Sanctuary. Her peaceful retreat is interrupted when a guest is murdered, and everyone seems to think she's the killer. A second murder proves her innocent, but sends her running back to Portland. Murder follows her home as dreams haunt her with what happened as she tries to get back to her life. When Simon shows up, convinced she's being stalked, her dreams become reality. As suspicion falls on Simon, Lynley knows he's innocent, but can she prove it before she's the next victim? Terrific but not spectacular. A visit to another animal sanctuary leads to murders. Who is killing all his closest friends and why?. A good plot that ends with the person you least expect being the culprit. The lead character annoys me and that is why this has got a 4* and not a 5. Don't know why she doesn't click with me.